Can a video of two jaguars be considered too risqué to share? We definitely had that conversation with the first jaguar mating video we collected on the Northern Jaguar Reserve in late 2013. We never dreamed there would be a second video that again revealed jaguars mating on our motion-triggered cameras in the wild. At the beginning of this year, “Luisa” and “Elvis” were photographed on the same camera a few weeks apart. In February, they appeared together in the same photograph (above), which led us to expect a cub. 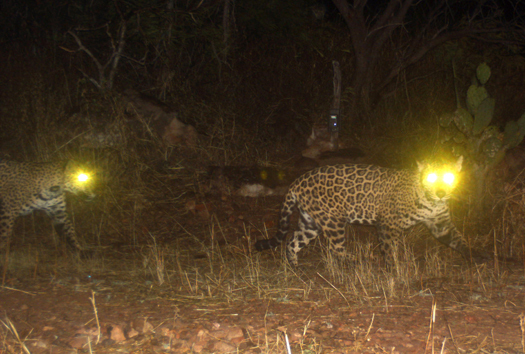 At the end of March, our motion-triggered cameras filmed this video (see below), and now we are certain there will be a young jaguar roaming the reserve later this year. This is the Northern Jaguar Reserve’s continuing love story. This is the place we come back to for perspective on how our focus to protect female jaguars and their cubs is both meaningful and essential for this population’s future. This video tells us we are headed in the right direction. View additional jaguar footage, including the original mating video, in our Video Gallery.